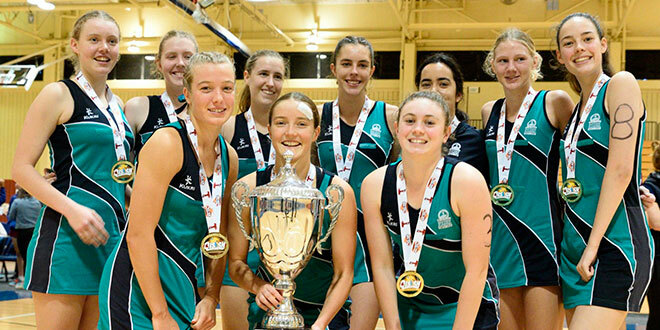 Queensland’s best: Netball players from Matthew Flinders Anglican College won the coveted QISSN Cup triumphing in the Division 1 grand final last week. NETBALL is fast growing into Queensland’s premier women’s sport with more than 700 girls turning up for the toughest competition among secondary schools. The 2017 Queensland Independent Schools Netball carnival, this year hosted by Mt Alvernia College, Kedron, between June 25 and June 30, saw netball teams from 60 secondary schools across Queensland compete for the “hotly contested” grand finals across six divisions. Matthew Flinders Anglican College beat Somerset College 43-22 in Division 1 to win the QISSN Cup grand final match. For the other divisions, Marymount College was awarded the Lara Nilsson trophy in Division 2, Siena Catholic College topped the Division 3 competition, Mercy College Mackay won Division 4, St Augustine’s College earned the Beryl Friday Shield in Division 5, and Blackheath and Thornburgh College were the winners for Division 6. The carnival coincided with the Confraternity Queensland Independent Secondary Schools Rugby League competition hosted by Padua College. QISSN president Ann Rebgetz said in a video on Facebook that the competition was “highly sought after” to the point that organisers were forced to start a waiting list. Ms Rebgetz said the high level of interest in the QISSN showed netball’s growing popularity. “With the sixty schools we really are taking those steps forward for our students to really say netball is the game to play in Queensland,” she said. The annual carnival has become more than just a chance to be name the best team in Queensland. Ms Rebgetz said the highlight of the competition was giving netballers pathways to a professional career in the game, with a partnership with Netball Queensland and Sunshine Coast Lightning, as well as guest appearances from Lightning and Firebird players. Netball coach and former Australian netballer Vicky Wilson and former Firebird Tracy Bruce were also invited as the 2017 selectors at the carnival. “They pick our all-stars team and a rising stars team and they’ve been here all week watching all our girls play, so in terms of the pathway for the future it’s all happening here,” Ms Rebgetz. “We cultivate that through our secondary schools. Players and spectators flooded social media with updates throughout the carnival week, showing Queenslanders are proud of their netball. “The level of competition and the standard have been fantastic,” Ms Rebgetz said.